That was a great day. 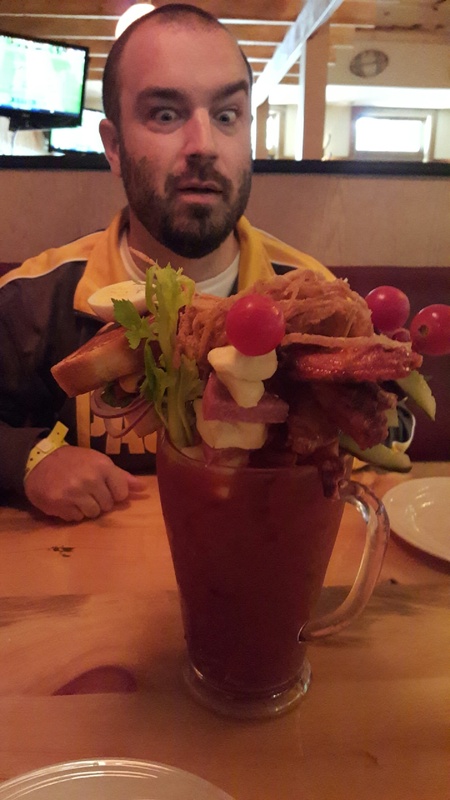 Not only did I get to celebrate with my hubby, get complimented, and have a giant Bloody Mary but I also learned that this year I’m good luck to the Packers!! Only when I looked away or went to the bathroom did the other team score. Then that happened again at the next game we watched so my husband called me good luck. I’ll take it!! Hopefully that luck continues throughout the season. This is just one of a few different Packer looks I like, but this has by far been my favorite and most used one recently so I hope you like it!! Here’s how! Prime your eyelids with a eyeshadow primer to blur imperfections and get your makeup to last all day. Then set the primer with a cream skin-colored eyeshadow so that blending is easier down the line. Highlight the inner corner of your eyes with a champagne looking shimmer and then apply this also right under your brow bone for some depth. Apply a peach colored eyeshadow with a fluffy brush as your transition shade above the crease to make blending more seamless. 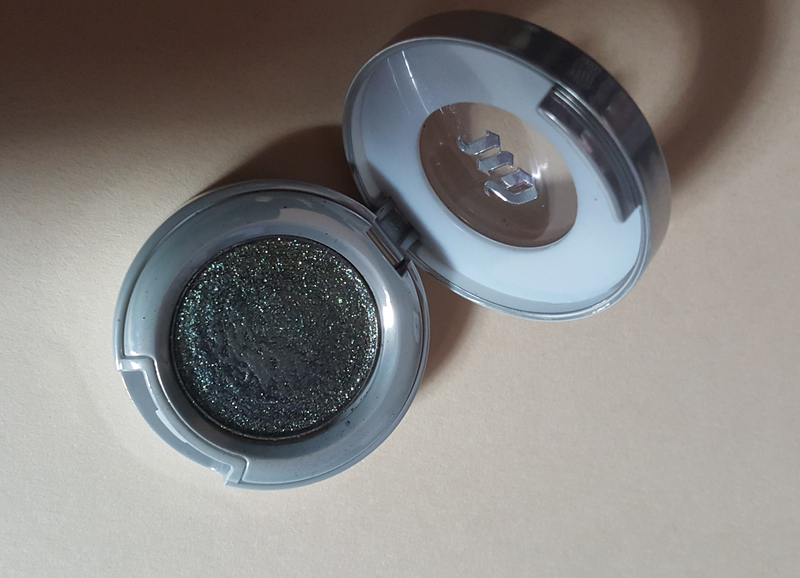 Because of the glitter and duotone capability of this eyeshadow there is a little possible fallout when applying it so I like to use a white cream base on the inner 3/4ths of my eyelid to give it even better sticking power and bring out those different tones. On the outer corner of your eye apply a black cream eyeliner, again for sticking power and also bringing out the different shades of the eyeshadow. This part doesn’t have to be perfect as we are going to cover it up soon! 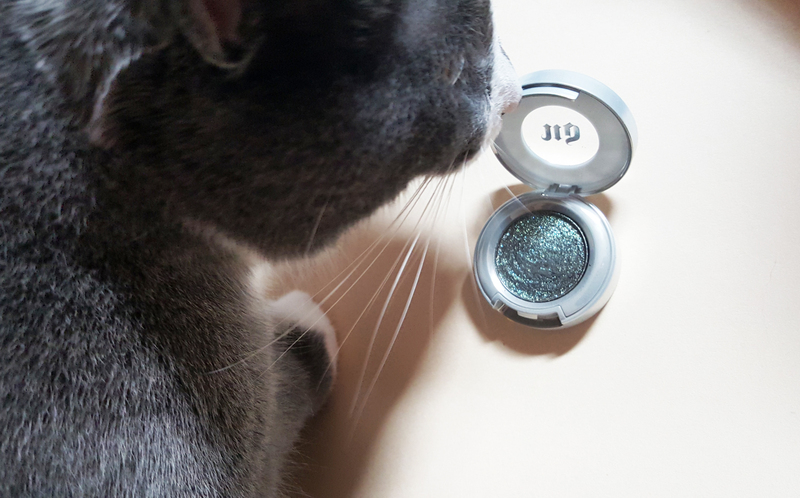 I find that I get the best application of this eyeshadow using my finger and packing it on my eyelid above the cream bases that you just applied. Not enough glitter? 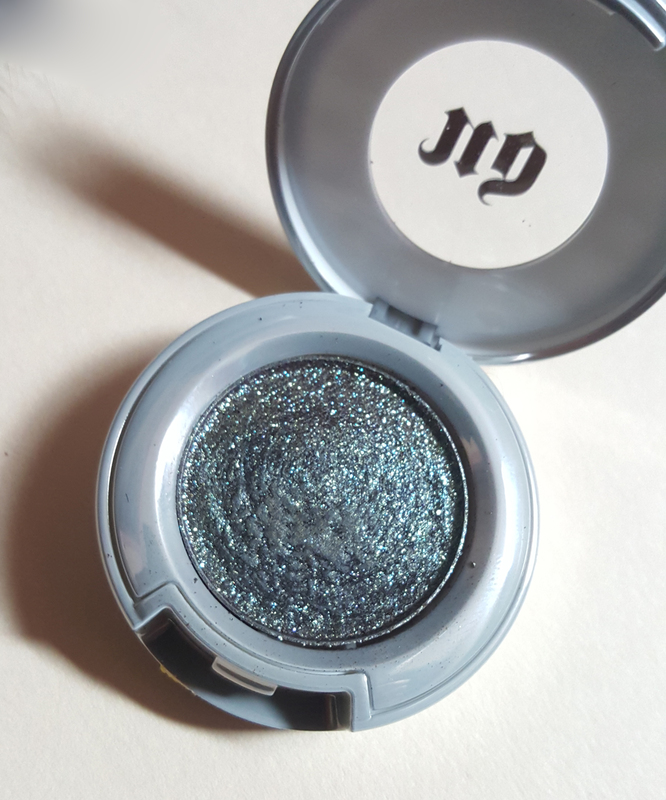 Keep packing it on and freaking love the shimmer. Blend out any harsh edges with your peach eyeshadow. 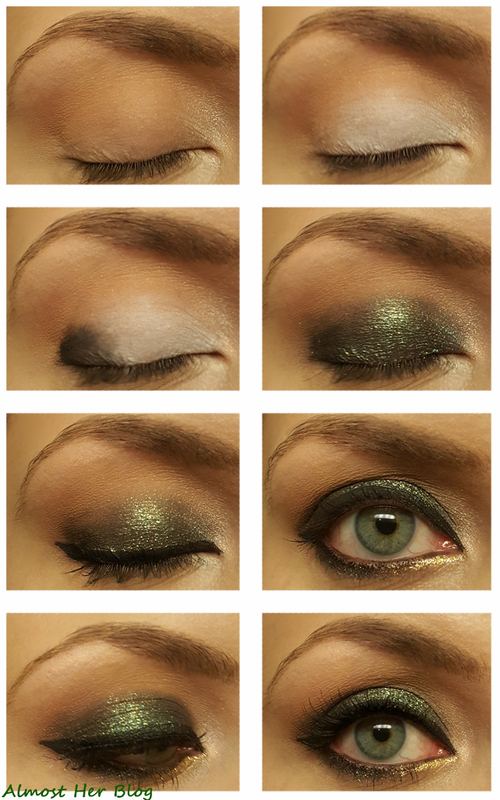 Using a black liquid eyeliner line your eye and create a small wing if you wish to kick it up a notch! 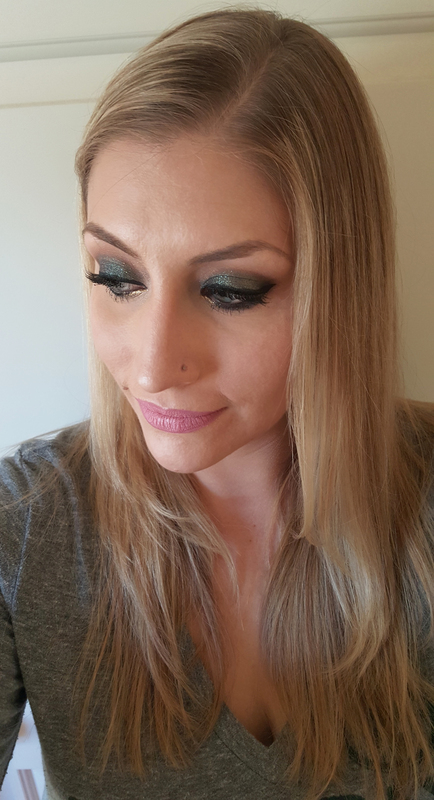 Line the bottom lash line with a back gel eyeliner and then taking an angled brush apply the green sparkly eyeshadow above it on the outer lower half. Taking the liquid crystal liner in gold line the inner lower lash line for a pretty pop of gold and glitz!! Green and Gold! Curl those purdy lashes and add some mascara and fake lashes if you’d like and voila!! 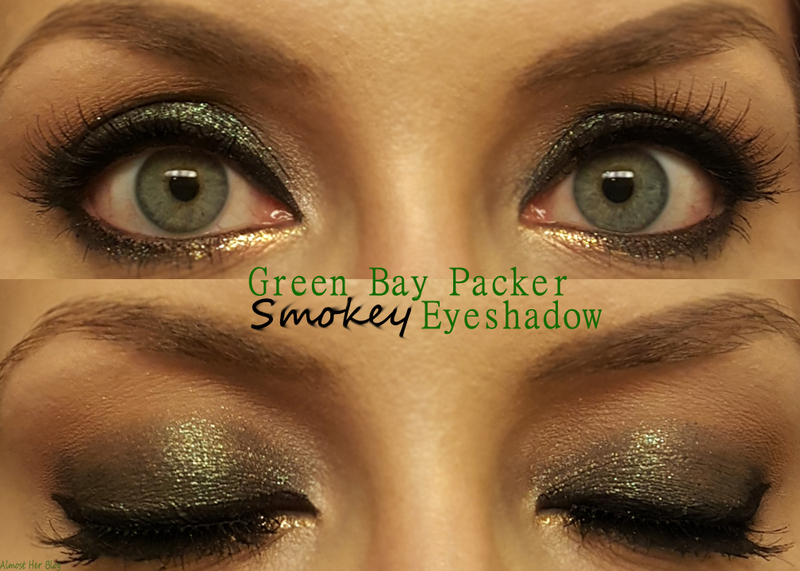 Beautiful Green and Gold Smokey Packer look! 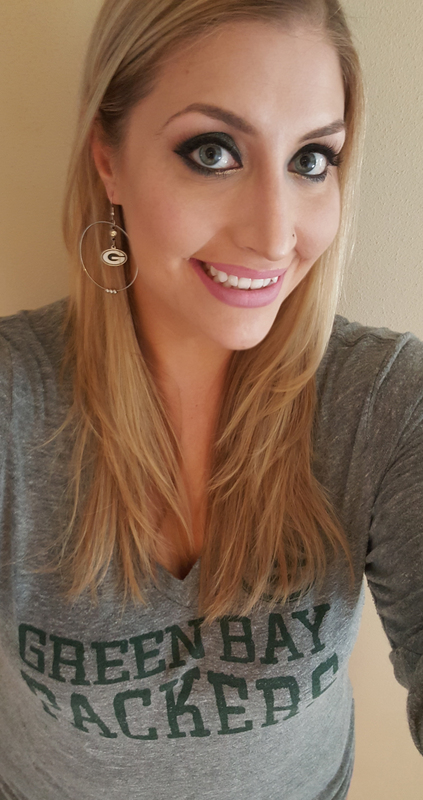 Got my Packer shirt and earrings on too!